Over at The Foundry, Kathryn Nix and Alyene Senger consider the tax impact of the Patient Protection and Affordable Care Act – known as “Obamacare” to its critics and supporters alike. Many recent sources have pointed out that “the wealthy” would be better off if PPACA were found unconstitutional, because of the 3.8% surtax included in the law for those earning more than $200,000 a year. 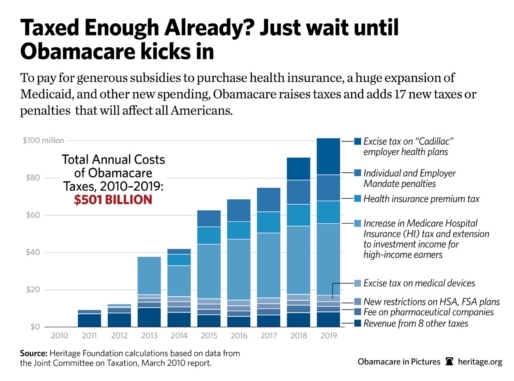 Nix and Segner argue, however, that the tax burden of Obamacare will end up being quite widespread and fall on the majority of the U.S. population, not just a handful of high-income earners. Obamacare raises taxes by more than $500 billion in a decade, and a number of these will hit Americans at all levels of the income scale. In fact, the higher payroll tax rate will eventually hit a huge majority of Americans. If you’re wondering how the tax law changes in Obamacare will affect your household in particular, make your way to the Health Care Tax Calculator, where you can get a quick estimate of how much your tax burden will rise as the law phases in. For more information on the constitutionality of the law itself, see the Tax Foundation’s Supreme Court brief, The Health Care Individual Mandate is Beyond Congress’s Taxing Power, by Joseph Henchman and Laura Lieberman.